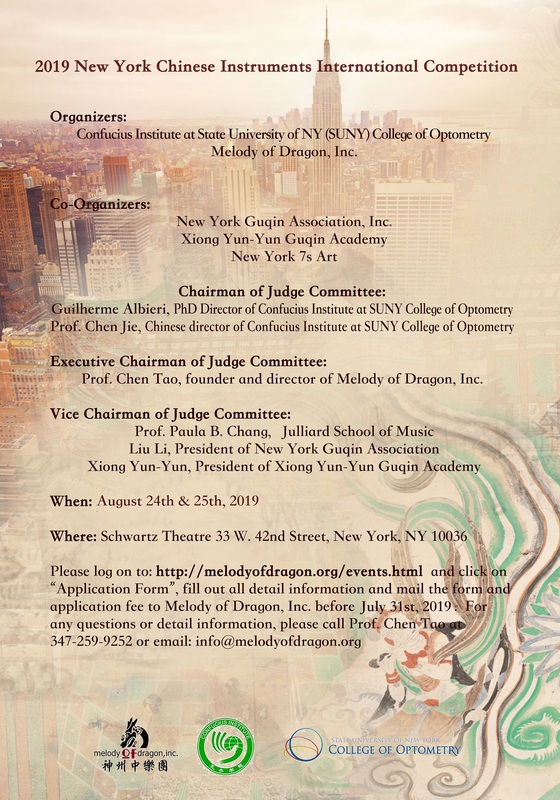 "2019 New York Chinese Instruments International Competition" -- will be held on August 24 & 27, 2019 in New York City. Please click on the "Application Form", then print and fill out this application form, send along with your check or money order before July 31, 2019. For more details, please call 347-259-9252. 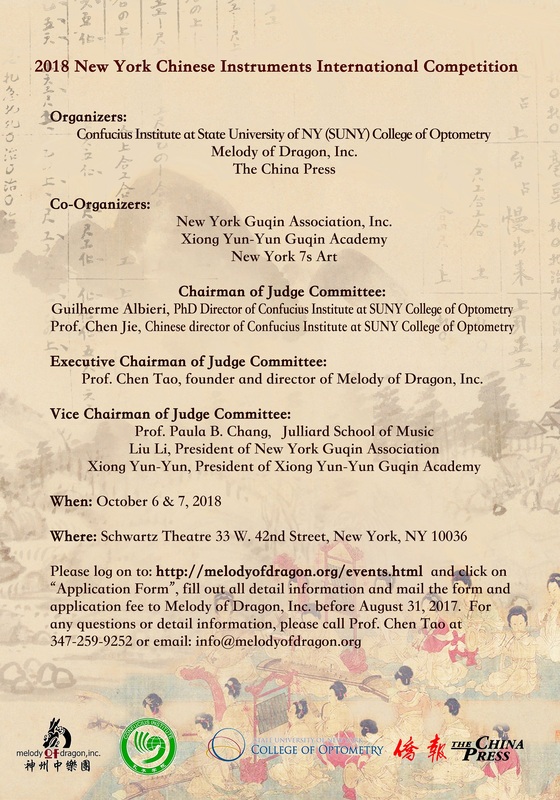 "2018 New York Chinese Instruments International Competition" -- will be held on October 6 & 7, 2018 in New York City. Please click on the "Application Form", then print and fill out this application form, send along with your check or money order before August 15. For more details, please call 347-259-9252. 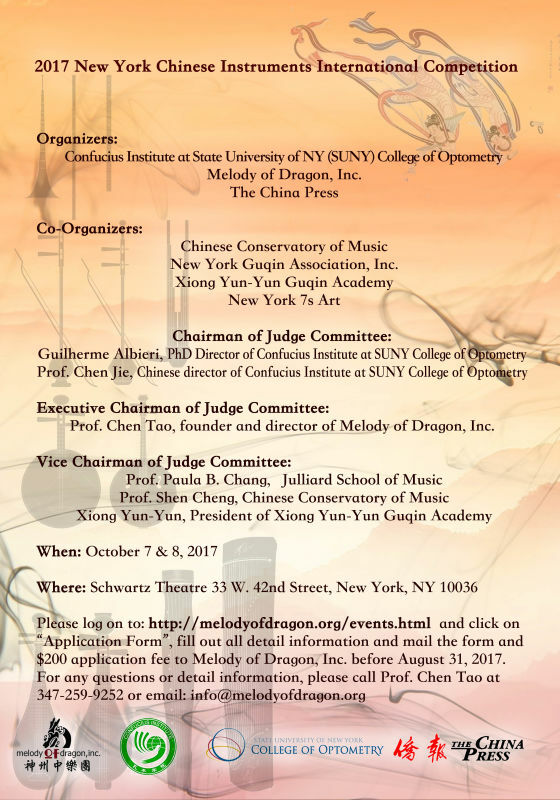 "2017 New York Chinese Instruments International Competition" -- will be held on October 7 & 8, 2017 in New York City. Please click on the "Application Form", then print and fill out this application form, send along with your check or money order before August 31. For more details, please call 347-259-9252. "2016 New York Chinese Instruments International Competition" -- will be held on August 20 & 21, 2016 in New York City. Please click on the "Application Form", then print and fill out this application form, send along with your check or money order before July 30. For more details, please call 347-259-9252. 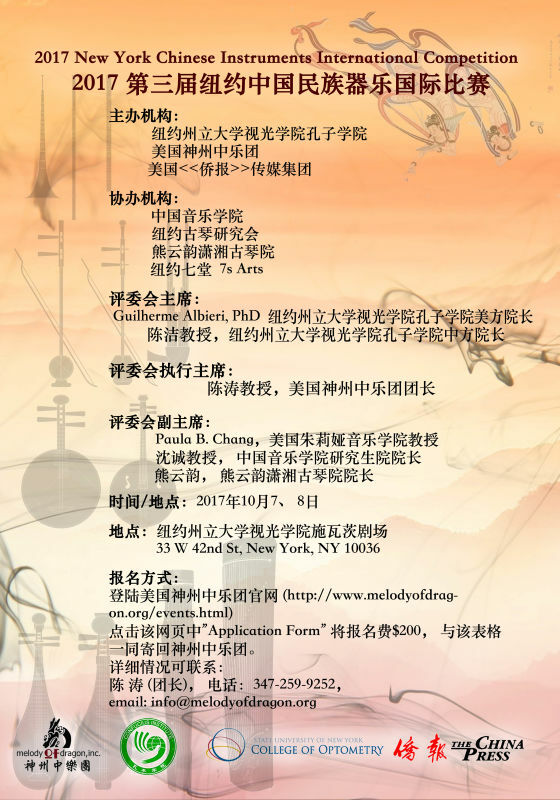 "2015 New York Chinese Instruments International Competition" -- will be held on October 3 & 4, 2015 in New York City. Please click on the "Application Form", then print and fill out this application form, send along with your check or money order before September 10. For more details, please call 347-259-9252. 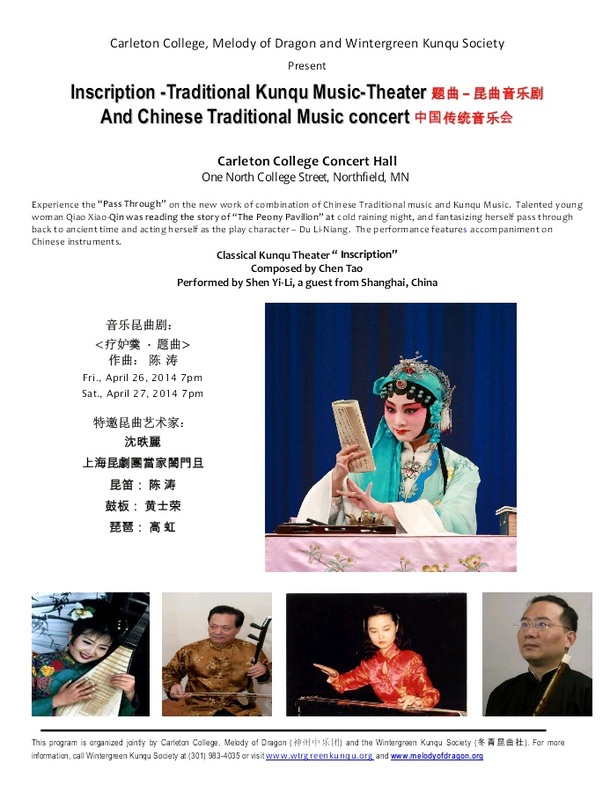 "Inscription" -- a new work of combination of Chinese Traditional Music and Kunqu music will be presented at Carleton College in Northfield, MN and Macalester College in St. Paul, MN from April 25th through April 28th in 2014. This presentation will be fetured on the top-notch Kunqu artist, Ms. Shen Yi-Li, who directly from Shanghai Kunju Company. In adittio to the Kunqu Music Theatre, Ms. Shen Yi-Li and Mr. Chen Tao will also host a lecture/demostration to introduce the history of Kunqu music and relationship between Chinese Tradtional Music and Kunqu Music. For more information on Kunqu performance, please call (301)983-4035 or visit: Wintergreen Kunqu Society. 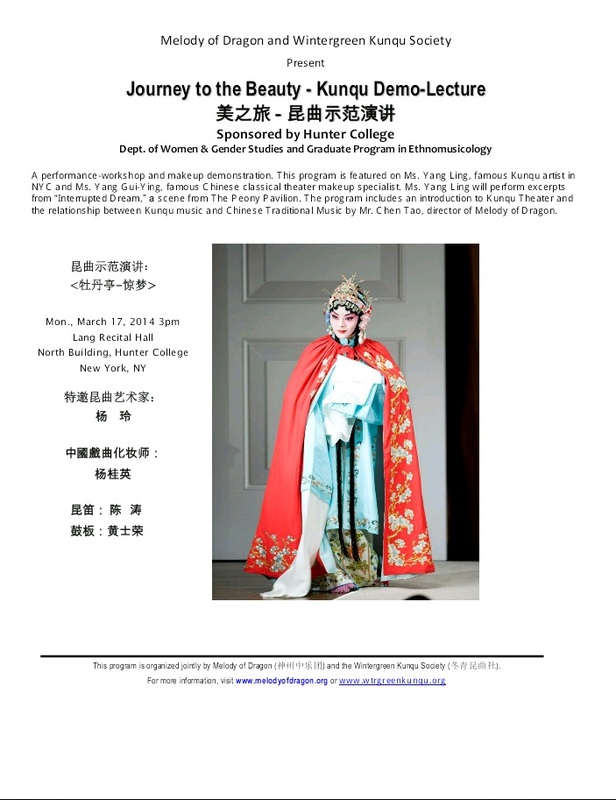 "Journey to the Beauty" -- Kunqu Demo-Lecture will be presented by Melody of Dragon and Wintergreen Kunqu Society at Hunter College in Midtown Manhattan, NYC at 3pm on March 17th, 2014. This presentation will be fetured on famous Kunqu artist, Ms. Yang Ling and famous makeup specialist, Ms. Yang Gui-Ying. The program also includs an introduction to Kunqu Theater and the relationship between Kunqu music and Chinese Traditional music.For more information on Kunqu performance, please call (301)983-4035 or visit: Wintergreen Kunqu Society. 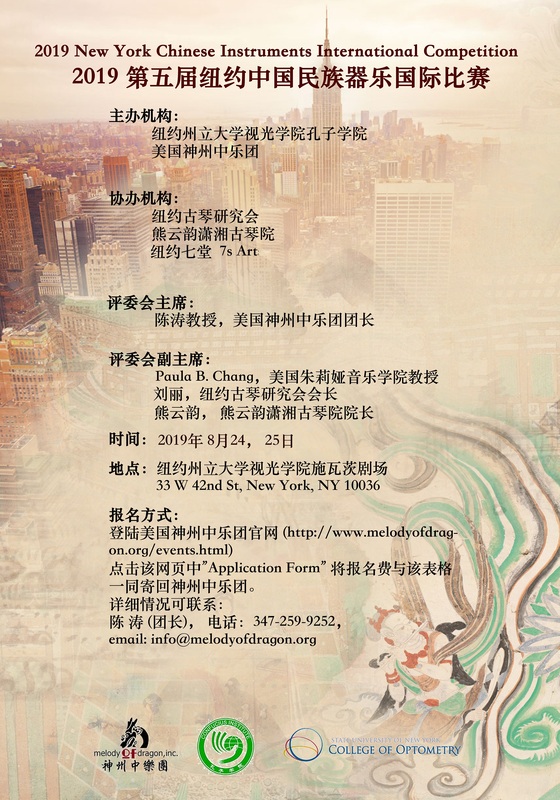 Sponsored by The InterChurch Center, Melody of Dragon will provide a Traditional Chinese Music concert to celebrate Chinese New Year at The InterChurch Center in Upper Westside New York City. Sponsored by Midori & Friends, Melody of Dragon will perform a Traditional Chinese Music Concert at PS 42 public school in Chinatown, NYC. Sponsored by music department of Hunter College, Melody of Dragon will present a special Traditional Chinese Music concert to celebrate "Asian Pacific Heritage Month on May" at 7pm in the Lang Recital Hall on the 4th floor of the North Building at Hunter College in NYC. Sponsored by China Institute in America, Melody of Dragon will provide a special program "Teaching China" at China Institute in America to introduce Chinese culture and Chinese Traditional Music. Sponsored by Community Unitarian Church at White Plains , Melody of Dragon will provide a Traditional Chinese Music performance at the Community Unitarian Church at White Plains, Westchester, NY to celebrate 2013 Chinese New Year (Year of the Snake). Sponsored by Macy's, Melody of Dragon will provide a multiple Chinese Arts show to celebrate Chinese New Year at Macy's in Flushing, New York City. The program including: Chinese Traditional Music, Lion Dance, Chinese Beijing Opera, Chinese Paper Cutting and Chinese Traditional Dance. 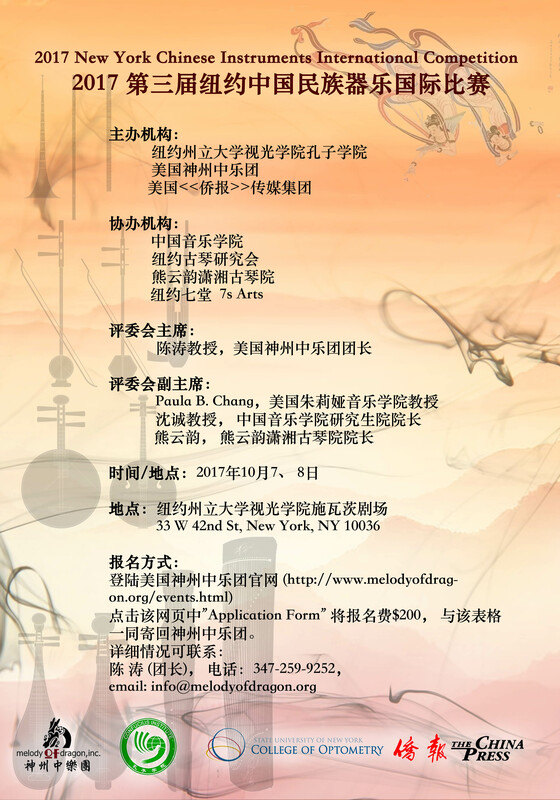 Sponsored by The Pingry School in New Jersey , Melody of Dragon will perform a Traditional Chinese Music Concert to celebrate 2013 Chinese New Year. Sponsored by Empire State Building, Melody of Dragon will provide a Traditional Chinese Music performance at the Empire State Building to celebrate 2013 Chinese New Year (Year of the Snake). As the 27th generations of Buddhist music descendant of Beijing Zhi Hua Temple, Chen Tao will lead a special Buddhist music concert in Jorden Concert Hall in Boston. Sponsored by China Institute in America, Melody of Dragon will provide Traditional Chinese Music demonstration and concert at China Institute in America. As guest artist, Chen Tao will perform with musicians at Stony Brook University in Long Island. Sponsored by Macy's, Melody of Dragon will provide a multiple Chinese Arts show to celebrate Chinese New Year at Macy's in Flushing, New York City. The program including: Chinese Traditional Music, Lion Dance and Chinese Beijing Opera. Sponsored by Empire State Building, Melody of Dragon will provide a Traditional Chinese Music performance at the Empire State Building to celebrate 2012 Chinese New Year (Year of the Dragon). 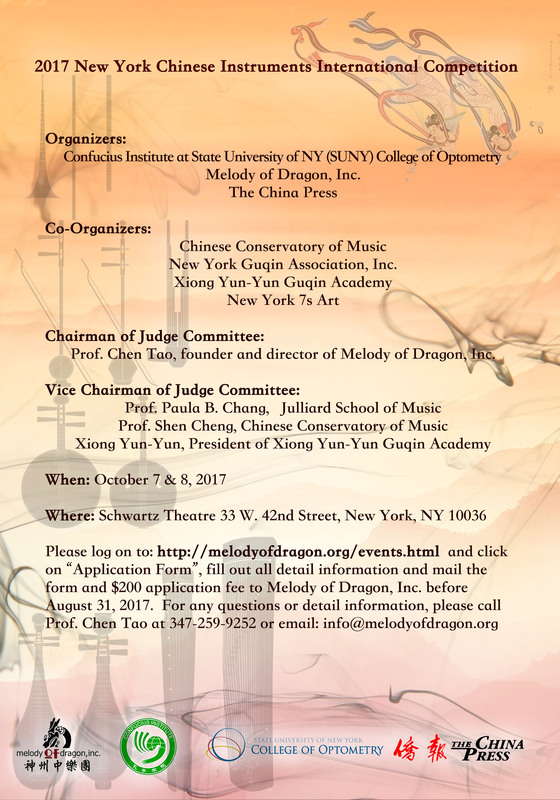 Sponsored by Midori & Friends, Melody of Dragon will held a Chinese string master class at Riverdale Country School in Bronx, NYC. As guest artist, Liu Li and Chen Tao will will perform with musicians from Melody of China to premiere a new work by composer Gang Situ featuring the Qin, the ancient seven-string zither in San Francisco. Sponsored by Midori & Friends, Melody of Dragon will perform a Traditional Chinese Music Concert at PS 170 public school in Brooklyn, NYC. Sponsored by Midori & Friends, Melody of Dragon will perform a Traditional Chinese Music Concert at PS 203 public school in Brooklyn, NYC. Sponsored by Midori & Friends, Melody of Dragon will perform a Traditional Chinese Music Concert at Reverdale Country school in NYC. Sponsored by music department of Hunter College, Melody of Dragon will present a special Traditional Chinese Music concert titled "Where the Dragon are?" at Hunter College in NYC. Sponsored by Midori & Friends, Melody of Dragon will perform a Traditional Chinese Music Concert at PS 42 school in downtown Mahattan, NYC. Sponsored by Midori & Friends, Melody of Dragon will perform a Traditional Chinese Music Concert at PS 180 school in Upper Westside Mahattan, NYC. 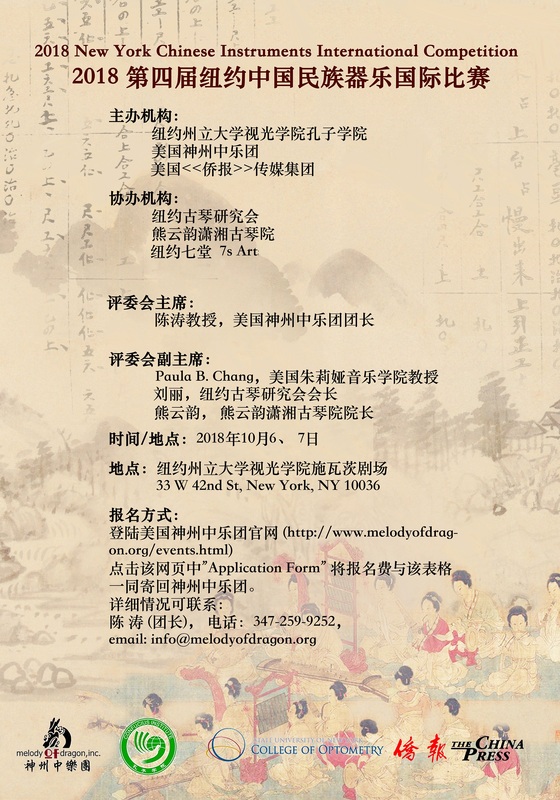 Sponsored by Midori & Friends, Melody of Dragon will perform a Traditional Chinese Music Concert at PS 57 school in Upper Eastside Mahattan, NYC. Sponsored by Jack Vartan Entertainment Associates LLC, Melody of Dragon will provide a Traditional Chinese Music concert for elders to celebrate Chinese New Year at Elder Care Center in Livingston, New Jersey. Sponsored by Midori & Friends, Melody of Dragon will perform a Traditional Chinese Music Concert at PS 877 school in Queens, NYC. Sponsored by The Riverside Church, Melody of Dragon will provide a Traditional Chinese Music concert to celebrate Chinese New Year at Riverside Church of NY in Upper Westside New York City.